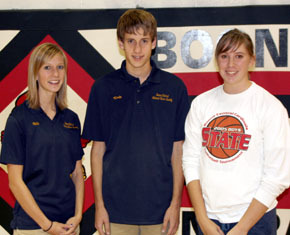 Three Boone Central athletes were members of the 2008 All-State cross country and girls golf teams announced by the Nebraska Coaches Association. Cardinal senior Halie Smith and junior Kevin Carder were awarded all-state honors in cross country. Sophomore Brooke Bolin was an all-state selection in girls golf. This is the 11th year the NCA has recognized athletes in cross country, girls golf and boys tennis for all-state recognition. The selection procedure includes consideration of finishing times/scores at state meets and correspondence with high school coaches in each sport. Each student-athlete will receive a certificate indicating their selection. Halie Smith capped her banner senior season with a fifth-place finish in the Class C girls race at the 2008 NSAA Cross Country Championships. That performance followed her first career victory in the C-2 District meet the previous week. Smith also won the ‘08 Mid-State Conference gold medal while placing sixth in the tough Bloomfield Invitational. Junior Kevin Carder had a breakout season in 2008. After winning the prestigious York Invitational, Carder placed second in the Mid-State Conference and third at the C-2 District behind eventual Class C state champion Jarren Heng of Norfolk Catholic, then turned in a sterling third-place effort at the state meet in Kearney. Sophomore Brooke Bolin virtually rewrote the Cardinal girls golf record book in her second varsity season. Bolin concluded her outstanding campaign with a runner-up finish in the C-2 District tournament to eventual state champion Danielle Lemek of Doniphan-Trumbull, then scored a school all-time best third place in the 2008 Class C State Tournament. Along the way, she set school records for best nine-hole score (36 in BC Invite), best 18-hole score (77 at district) and best 36-hole score (165 in state meet).